Our products and services are here to help and protect the environment. Aussie Environmental sell a wide range of erosion control products that are made from 100% renewable resources. We sell a range coir and jute erosion control blanket sourced from 100% natural fibres. Coir is the fibre from the coconut husk, extracted between the hard, internal shell and the outer coat of a coconut and is 100% renewable. Jute is a vegetable fibre produced from plants in the genus corchorus. These plants are native to tropical and subtropical regions throughout various parts of the world. Coir and jute erosion control products are all 100% biodegradable, unlike geosynthetic erosion control products made from polypropylene or polyester. Biodegradable erosion control products naturally break down over time and produces far less pollution and water use in the manufacturing process. The best form of erosion control is sustainable vegetation. Vegetation protects the surface from rain and wind erosion and binds the underling soil to improve its structural strength and improves soils water holding and infiltration capacity. Vegetation is not only a great form of erosion control but planting trees and grasses increases oxygen and removes carbon dioxide and contaminants from the air. 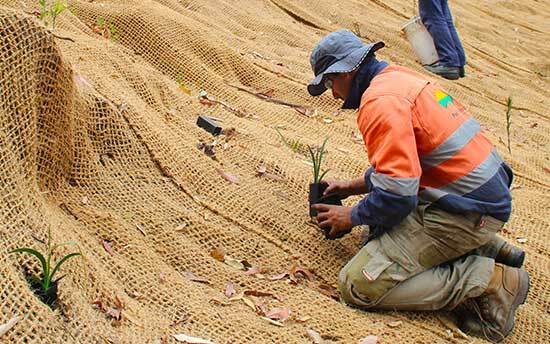 Our biodegradable natural erosion control blankets and meshes are great for revegetation and planting into. Our blankets and meshes break down naturally over time providing erosion and evaporation protection while the vegetation becomes established. This provides long term sustainable erosion control solution mimicking a natural ecosystem including providing local wildlife habitats. For more information on our native seed hydromulching services click here. Aussie Environmental provide marine, waterways and stormwater protection products and installation. Our aquatic booms provide protection from silt, sediment, oil containment, debris and aquatic weeds from entering our waterways. These products help protect our wildlife from oil contaminants and harmful rubbish such as plastics which marine life usually ingesting or get entangled in. Aussie Environmental also provide products that protect pollutants from entering our stormwater ways & drains keeping our waterways and dams cleaner. Erosion is an ongoing process in all landscapes. Therefore, erosion and sediment control is an activity that all land managers have to manage. There are legal responsibilities to take all reasonable and practicable measures to minimise short and long-term soil erosion and minimise adverse effects of sediment transport. Adverse effects may include water quality and aquatic health issues, drainage and flow problems, damage to adjoining infrastructure, environments and increased clean-up costs. An organic garden is a garden made and containing entirely organic materials, and in other words avoiding synthetic fertilisers and pesticides. Aussie Environmental sell a range of garden products to help get your organic garden to thrive including: biodegradable pots, plant supports and mulches. Our long lasting eco sustainable mulches are made from renewable coir. Our coir peat & chip mulches are unfertilised, promote aeration and have a neutral ph. level which are ideal for organic gardens.